When he looks at the future of retail, Evo founder Bryce Phillips believes that it looks something like the brand he’s created. An outdoor retailer, Evo welds together online sales, brick and mortar stores, a travel business, and an outreach program to local retailers. It might seem like a fool’s errand to build a retail brand in the shadow of Amazon, but Phillips believes that Amazon has created room for niche retailers, not smothered it. The core of Evo’s business is an extensive e-commerce site. “It’s all the things we love,” Phillips says of the brand’s product mix, which includes surf, snow, skate, and mountain bike gear. His background includes a stint as a pro ski racer for K2 and Patagonia. He also says he’s been selling products his whole life, from baseball cards at elementary school to ski equipment out of his garage. Evo’s three physical stores, located in Denver, Portland, and Seattle, feature eye-catching architecture, an effort to make them into appealing destinations with art shows and other special events. Evo’s Seattle store is home to an indoor skate park and two restaurants, Joule and The Whale Wins. 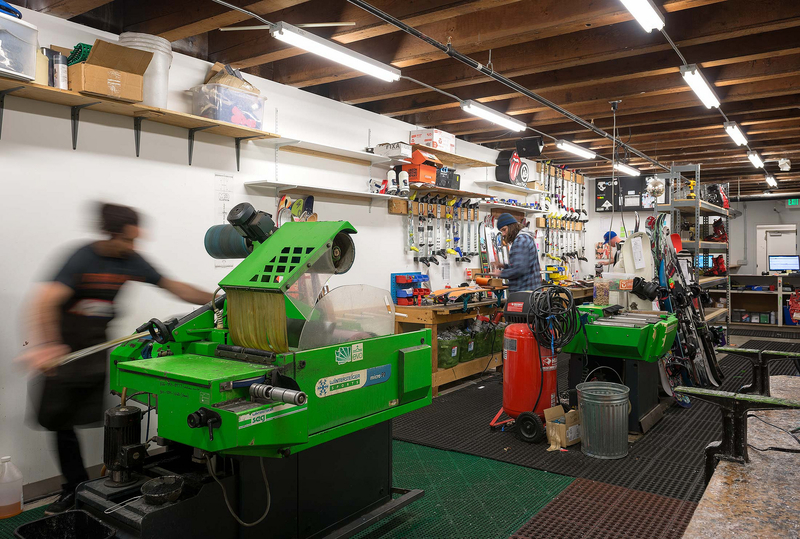 On-site service shops are available for customers to get their new snowboards and mountain bikes properly fitted and dialed in. Phillips views Evo’s service program as one way to differentiate from Amazon’s long reach and discounted pricing. It’s not enough to only sell customers a product. Phillips points to Sports Authority, the big box store that filed for Chapter 11 in March 2016, as an example of the kind of retail outlet that’s especially vulnerable to competition from Amazon. For customers beyond the reach of its three brick-and-mortar shops, Evo has the La Familia program. Customers can opt to have their new mountain bike or snowboard shipped to a local store, where staff can do any maintenance and adjustments that might be necessary. Though La Familia retailers don’t profit from the initial sale, it’s a way to direct foot traffic to local outfitters and help customers find quality mechanics and technicians. Phillips believes these local outlets are essential to the future of the outdoor industry. Buying generic consumer goods — like toilet paper — online is simple, because these products don’t need assembly or service. But the technical hard goods prevalent in the outdoor industry do. A bike that doesn’t shift or ski boots that don’t fit correctly mean frustration for the customer, who might abandon their new outdoor hobby. That’s a lost customer for Evo and potentially for the industry as a whole. In its quest to differentiate from other outdoor outlets, Evo constantly looks for ways to build community among customers with shared interests. One path is a new partnership with The Loge, which develops outdoor destinations. The first of The Loge’s properties is a surf lodge in Westport, Washington, a commercial fishing town west of Seattle. The Loge in Westport includes a renovated motor inn, camp sites, and a dorm-style hostel. The property is designed to provide private spaces, while also encouraging community around shared fire pits. 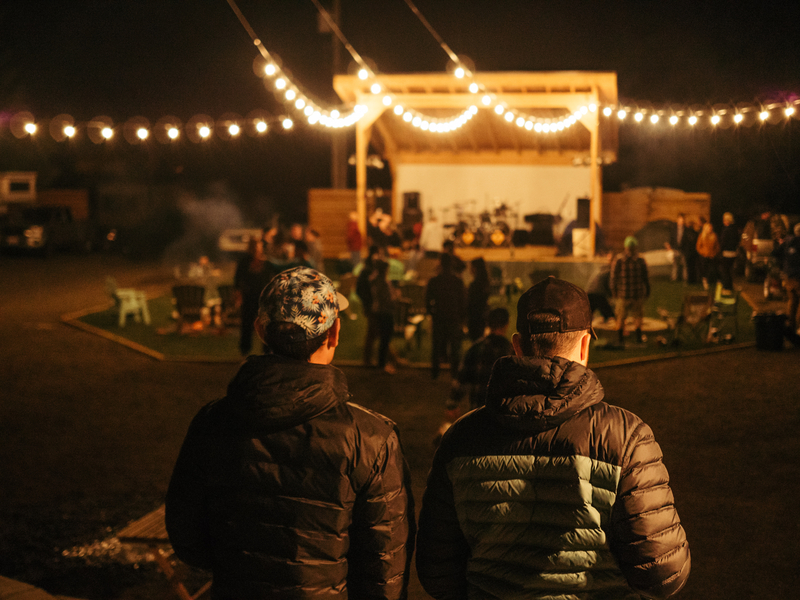 There’s a stage for live music and yoga classes, while a small indoor space doubles as a coffee shop supplied with locally roasted beans and a bar serving Washington microbrews. “Community building was the foundational premise for many of our favorite features at the Westport property and we prioritized this in our design,” says Johannes Ariens, a Loge cofounder. It’s nearly impossible to stay at The Loge and not meet at least one or two of the other guests. Evo provides the gear for rent at The Loge, which, in Westport, includes surf necessities and beach cruisers. Future Loge properties will focus on snow sports and mountain biking and possible locations including Snoqualmie Pass and Leavenworth, Washington. Along similar lines, Evo hosts between six and eight trips each year through their EvoTrip program. An upcoming October 2017 surf adventure, for example, heads to El Sunzal in El Salvador. Past trips have included skiing in Las Trancas, Chile, and a sea-plane flight to mountain bike in British Columbia.